first post here, lot of chances I move to Chengdu for march 2015 and my only concern is about a VOIP phone line, I need to receive and make calls to USA from Chengdu. I want to use a system with CLOUD PBX. 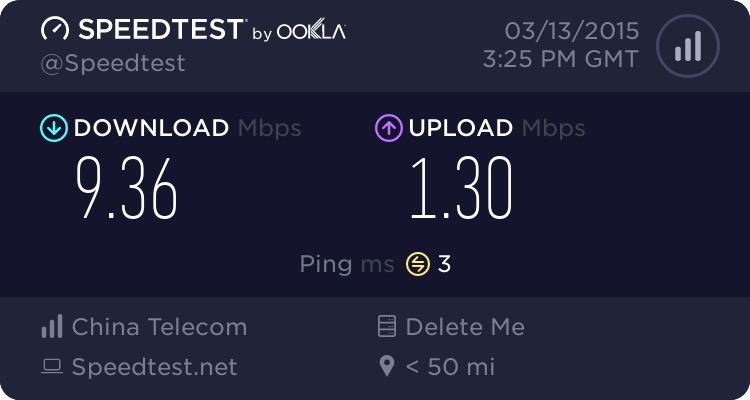 I need the minimum 0.07mbps for the upload at all time, this is not the problem, but what about the packets lost, latency and jitter ? Anyone using a VOIP line from Chengdu for north America use ? Arrived in Chengdu, leaving in baicao road metro area and I took the 169rmb plan from China Mobile with 50mbps internet. 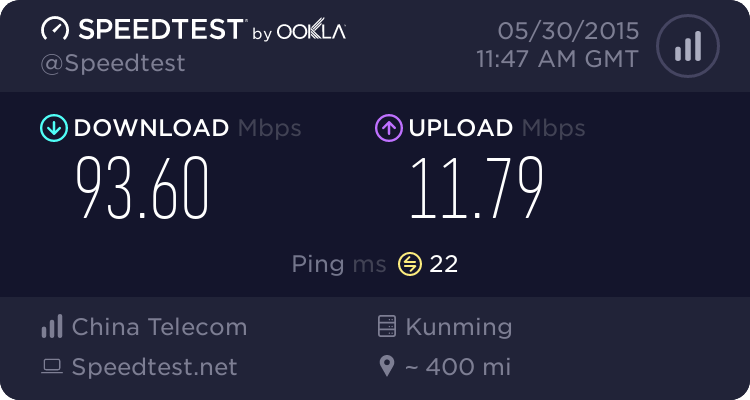 I got the 50mbps often it reduces to 10mbps, upload is about 1.5mbps, ping 2 to 3 ms.
My voip line is not that good quality, so I was wondering if I would get better quality from China Unicom, almost all the testing of you guys in this thread are from China Telecom, is there someone here who has some good speed with Unicom ? Possible to get more on the upload ? I’m curious to know how many of you are on carrier-grade NAT now? China Telecom have been discretely moving people on to it for a couple of years. Check to see if your WAN IP is 100.64.x.x. Not me, I’m on 222.211. My WAN IP is 100.64.x.x Is this good or bad? It’s good for China Telecom. They get to delay deploying IPv6 for a few more years. It’s bad for heavy or more technical internet user as it can cause brokenness in applications, especially server based ones like bittorrent seeding. I paid an extra 20rmb a month since saturday to reach 4mbps upload but instead best I get is 2.5mbps for upload. 20M upload on Unicom is pretty sweet, SergioDragon! Too bad Unicom’s broadband doesn’t my new apartment complex. I’ve been on China Telecom for 5 years with so-so speed. Anyone here have China Mobile broadband? 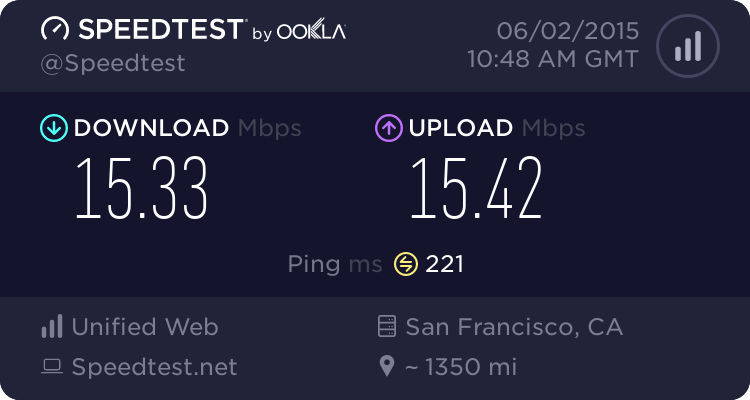 What kind of speeds do you get? China Telecom have a new service – 100Mb/s down, 10Mb/s up for 169RMB / month. They also give you a 4G sim card with 17GB of data each month – 15GB Chengdu + 2GB national. Does it require you to go there in person with passport or is it something that can be changed over the phone? Also, the previous 159/mo package includes iptv, does this one? Does it require you to go there in person with passport or is it something that can be changed over the phone? You have to go to your local CT office in person. Also, the previous 159/mo package includes iptv, does this one? Yes, apparently it is 4k IPTV. I seriously doubt they have any 4k content though. Holy crap, you got a 4G sim card with 17gb of bandwidth? Last time I went to China Telecom I learned that it’s a good idea to go on a regular basis, to get the newer and cheaper deals that they’re always offering (you can only switch to them in their office). I have a similar deal to you though, with the SIM card, the IPTV box, and the 100mbps fiber internet. The IPTV thing is pretty useless though, I had it hooked up for a while but none of the content on there really seems worth watching for me – it’s a huge selection of Chinese television. Holy crap, you got a 4G sim card with 17gb of bandwidth? yeah, I think 15GB of that is a new introductory offer that lasts for 1 year after which you have 2GB / month. Ours sits unplugged. Neither my wife or I are fans of Chinese TV, and the on demand content isn’t even close to as good as what I have stored locally. Actually everyone can change own internet plan , from China Telecom website, right? My wife watches Chinese news on it, that’s it.. it does have a 4K video section which has only 4K content. Problem with other on-demand TV services is no local news, which my wife needs, we also have a MiTV plug thing which I had bought for our previous maid to use but now it’s also useless, because the content is pretty crappy. Did the upgrade..not getting that high downstream on speedtest but upstream seems great! Although peering between different providers in China has improved in the last couple of years, it can still be pretty horrible. 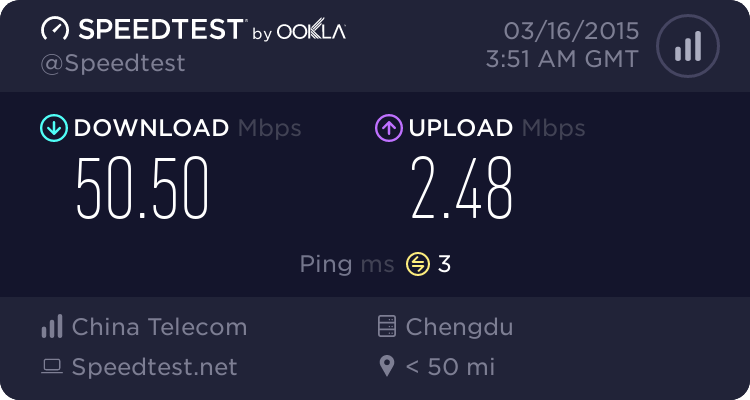 I believe the default server assigned by speedtest is currently on China Mobiles network. The best server to test on is in Kunming – “China Telecom”.